I went to the ortho yesterday (I was supposed to go 2 weeks ago, but one of my kids came home from school with a fever and my wife was out of town) and got rid of my boot. Wow. I didn’t realize how much of my weight was supported by my boot. I still have no sensation/numbness in the sole of my foot and my heel, and my ortho told me it would be a while (he never did say what a “while” was) before I get the sensation back. Other than that, I am loving life. My ortho said yesterday “looks great, no more boot, come back in 2 months if you need to, otherwise it’s been great.” I don’t have any restrictions on activity other than don’t do anything that hurts. I’ve been riding a stationary bike all summer and am stoked to get back on my brand new road bike I bought a week before I got hurt–I’ve ridden it twice. I am going to hold off on jogging for another month (or six weeks) or so, which means no indoor soccer this year, but I should be good to go for the spring! No crutches for some time now, and I am really getting around well. I started rehab this past week and so far, so good. I have regained some range of motion already and am really ready for this whole ordeal to be over with. I have 3 more weeks of rehab and my therapist has set me up with a home program that she recommends I continue for at least 3-6 months after our sessions stop. So far I have not had the discipline to do all of the exercises when at home, but I am doing 4 of the 6 with regularity. Also not having any pain in the repair site, but I the back of the sole of my foot has lost a great deal of sensation from the stitching in my boot rubbing and pressing against it. Has anyone else experienced this? I did get a great bit of news from my ortho at my last visit (2 weeks ago). I am healing very well and am ahead of schedule. In his estimation, I can start *running* on a flat surface at 3 1/2 months (about the 1st of October) and will likely be back to activities I was doing before the injury at 6 1/2 months (about the 1st of the year). That’s not to say that I will have completely regained my fitness but will be in the clear from re-injury. Wow. I had been so depressed about the recovery process and my lack of activity; that news totally snapped me out of my self-pity and really got me going again. I am riding an exercise bike 2 or 3 times a week now (with my boot on, but what the hey . . .). I used to hate riding exercise bikes, but it beats the hell out of lifting weights all the time. I visited my surgeon on the July 15th, had my cast removed, and received my boot. WOOHOO! Positives: I have my cast off and can bathe without my cast cover (big shout of thanks to KKDub!) and can finally scratch the sole of my foot. Negatives: Still can’t walk without crutches. My ortho told me to walk with crutches and to leave my boot on 23.75/7 (the quarter of an hour of time off is for showering–which by-the-way, is sublime, having gone without it for most of the time with the cast [(I bathed in the tub, and I don't like baths, but I digress]). His nurse told me that realistically, I would *probably* be able to walk sans crutches by Saturday (July 19th). Well, I was. I walked about 3 inches LOL. I still have swelling in my ankle and heel; there is enough swelling around the back of my leg that the area is hard/very firm to the touch. I am icing it and taking ibuprofen and this is helping. Today, I am able to walk with 1 crutch and take more than a couple of steps without any. This is a significant milestone, because now I can carry things with my free hand! Yippee! The rest of my family is away on vacation (again–we all just returned from a family vacation at Lake Michigan last week), and I have a new found respect for people live alone and have this injury. Wow. The ability to walk with one crutch and have a hand free to carry things has been heaven sent. 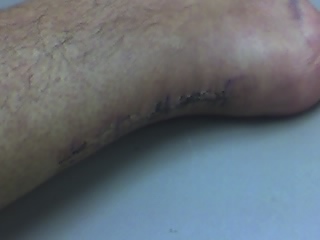 The photo is of my incision on the day of the appointment. The dried blood has since washed off and now all I have is a nice bit of pinkish scar tissue. So I have that goin’ for me, which is nice. I visited the ortho yesterday for a follow up. Mind you, this was 6 days post-op which is REALLY early in the process, but I am on holiday next week (to the beaches of Lake Michigan) and the ortho wanted to see me before we left. Upon my arrival I was escorted to the cast room where I had my splint removed (In the OR, I was placed in a splint, made of fiberglass that covered the back of my leg. This was wrapped in a flexible bandage, so the whole apparatus was quite light.) and was told I was next going to be xray-ed. The xray tech came in about 2 minutes later and I told her that I wasn’t sure why I needed and xray–I have a soft-tissue injury which would not appear in the image of the xray. She said that it was on my orders (I call B—s—!) to which I replied I am refusing the xray–I didn’t want the radiation exposure and I didn’t feel it was necessary, and I would discuss it with my doctor. She waddled off in a BIG huff. My doctor was 30 minutes late seeing me (did you ever know an ortho who wasn’t always late for an appointment? ), and when he came in, I asked him why he ordered an xray for a soft tissue injury. He said he didn’t, and wondered why it was on the orders (this particular practice is quite large–8 surgeons and 2 physicians assistants, its own physical therapy practice, imaging [xray, CT, MRI]). I then realized that they probably were just “padding” the bottom line for my visit by taking xrays. Long story short, I had a look at the incision, which is healing quite nicely. It’s about 6 inches in length running from the top of my heel bone to about 1/4 of the way up the back of my leg. I counted 27 staples holding the wound closed. I was placed in a full fiberglass cast (it’s a very elegent black) that feels as though it is “protecting” me better, and I do realize that it’s not providing any support or protection, it’s just immobilizing the ankle. It’s pretty light weight and so far, I haven’t had any problems. As I wrote previously I’m on holiday next week, and a bit disappointed I can’t swim with the kids because of the incision, but all-in-all, this process has gone very, well, swimmingly. My next visit is 15 July and I will be fitted with a boot and be PWB. WOOHOO! Keep your chins up everyone. This is definitely not the end of the world. For those of us who were quite active, it is a royal pain in the arse, but I am certain each of us will find other activities to keep us going. I live in Cedar Falls, Iowa, which is a town in north central Iowa, with 1 orthopedic surgeon. And since I didn’t exactly trust him to give me the best care, I had my ATR repair done by Dr. Peter Maurus of the Steindler Orthopedic Clinic in Iowa City. Iowa City is approximately 90 miles from Cedar Falls, so we had a bit of a drive ahead of us following discharge. In the course of full disclosure, let me also add that I lived in Iowa City for six years prior to moving to Cedar Falls. Before the ATR repair, I had never had surgery–no tonsillectomy, no ear tubes, no nothing–and so had never been under general anesthesia. Add to that the fact that my procedure was scheduled for mid afternoon (130PM) and that I had nothing to eat since midnight the day before, and I was RAVENOUS when I was discharged early that evening. My wife (who really should have known better, she of tonsillectomy [as an adult], and 2 c-sections) asked me what I wanted to eat and I said “uh, a cheeseburger and fries.” I inhaled whatever brand of fast food she got me in about 2 seconds flat and went back to concentrating on not getting car sick on the ride home, since I was sitting across the back seat of our car with my foot up on pillows. We were passing through the next big town (Cedar Rapids) on our drive home when I suddenly felt more nauseous than just my normal car-sickness. My wife had to pull over as I lost my lunch, as a result of the general or the percocet I had taken before hitting the road, I don’t know (in retrospect, I think it was the percocet, as the same thing happened to me in bed the next morning). In the end, we made it home and I hobbled up the stairs to our second floor master and collapsed in our bed. Great first time post-op, huh? Update: I originally created this entry as a page, but really wanted to make it a post (thank you Percocet!). Hello everyone. Great to have so much support, but I reallly wish I didn’t EVER have to be in a position to find such a site. I was playing soccer in a rec league a week ago when I suffrered my injury. I had made a point of arriving early and warming up and stretching as I had suffered a cramp in my other (right) calf while running the day before. I was playing goalie and went out to challenge a player with the ball. When I left my line I heard a loud popping sound–like a champagne cork–and I thought I had snapped the laces on my new soccer shoes. I fell to the ground and looked at my feet and realized that the laces were still there, and thought I must have suffered a knee injury. But I had no pain in my knee (or my injured calf either), so I just tried to stand up. When I couldn’t put any weight on my left foot, I pretty much knew what the problem was. People across the field said they heard the popping sound. I get really mad at people who suggest that I suffered this injury because I am some sort of out of shape weekend warrior who overdid it. I work out–running, cycling, lifting–5+ times a week. That, so far, has been the most painful thing I’ve had to endure. So that’s it for today. I am going to the orthopod on Wednesday to have my surgical site examined. I’ll let you know what happens. He’s fitting me in early because I have vacation plans for the week of July 7 and he wanted to look at it before I left. Site Admin | Free WordPress ThemeChris’ recovery blog Copyright © 2019 All Rights Reserved.